Eastern Brocades, Day and Night Compared - Designed in 1886, Chikanobu's extraordinary "Eastern Brocade" series features a fantastic range of subjects, including brave warriors, eerie ghosts, timeless beauties, and famous figures from traditional tales of triumph and treachery. These beautiful images bring the history and legends of Japan to life with colorful characters and a wonderful attention to detail. 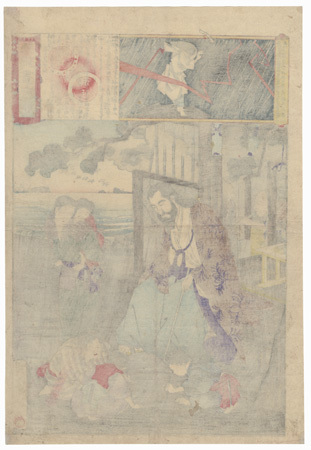 Note the appealing compositions and fine printing in these Meiji era masterworks, many of which include deluxe treatments such as burnishing, embossing, or the addition of mica. These attractive designs are a nice choice to collect or display. Lord Sugawara Michizane, No. 48 - Sugawara no Michizane, a ninth century courtier, was wrongly relieved of office and exiled into northern Kyushu. He taught local children how to write calligraphy, a story that became the basis for a kabuki play. Here he sits on a bench outside a rustic hut, guiding the children as they scratch characters into the dirt with sticks. Behind him an older man blows air onto a fire, puffs of smoke rising and drifting through the bamboo grate of the window. 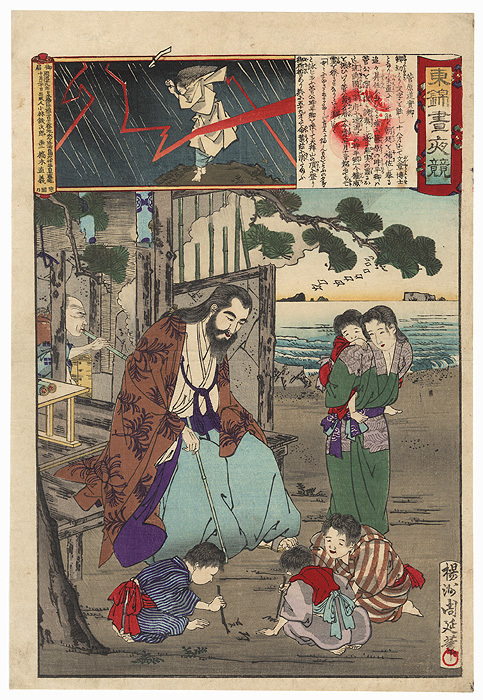 The top image shows Michizane on a mountaintop, praying to the gods during a thunderstorm as flashes of red lightening zigzag through the air. 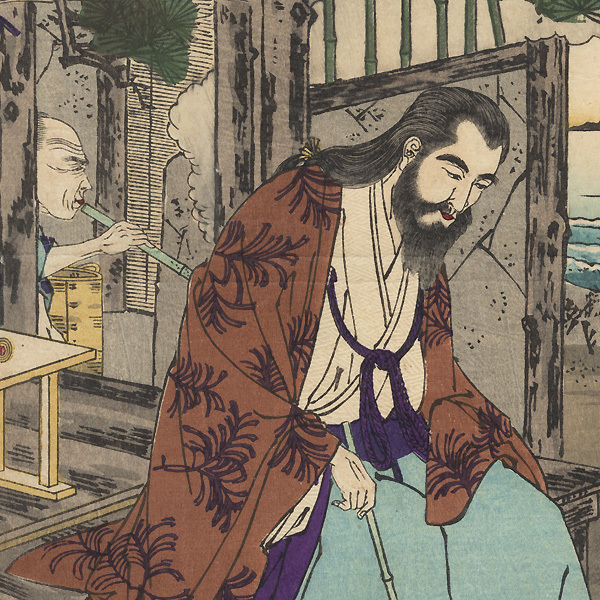 After his death, Michizane was deified as Tenjin, the Shinto god of learning. A charming illustration, beautifully drawn with delicate embossing on the white kimono and fine detail. Condition - This print with excellent color and detail as shown. Slight toning, slight soiling at edges, a few small spots and creases. Please see photos for details. Good overall.